Dallas-Fort Worth-based American Airlines flight attendant Maddie Peters finally had the privilege of meeting her CEO - something not everyone working at a Fortune 500 company can say. 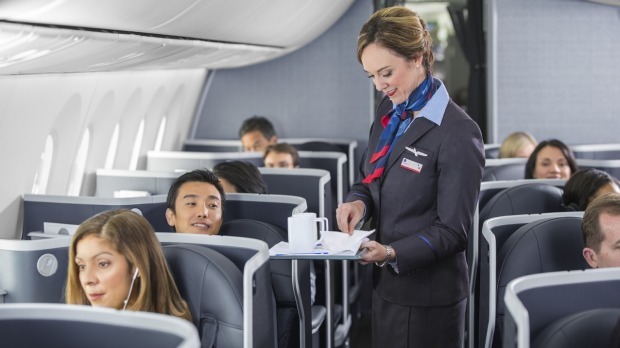 Peters has never spilled a drink in her four years as a flight attendant. She also never imagined that when she inevitably did, it would be an entire tray of them - and that the chairman and CEO of the largest airline in the world would be the passenger on the receiving end. She was working a recent flight from Phoenix to D-FW, serving more than half a dozen pre-departure drinks to the first-class cabin, when a passenger unknowingly bumped into her. "I had a full tray with drinks on it, when the passenger in front of me stops in the aisle and backs up," sending the entire tray of drinks flying, Peters described in her Instagram post Monday. Half of the drinks fell on her and the other half went into the lap of American CEO Doug Parker. Though she was mortified, Parker was a good sport about it, Peters said. He understood that accidents happen, laughed it off and caught up with her after the attendants had finished serving the first-class passengers. Story time with @maddieryanee ! So yesterday I worked a flight from Phoenix to Dallas. I had our CEO (Doug Parker) on my flight. I was just doing my job, serving my predeparture drinks. I have a tray of drinks on it when the passenger in front of me stops in the aisle and backs up. Hits the tray and the drinks go flying. Guys I have worked for American Airlines for 4 years, and not once have I ever spilt a drink on a passenger. Guess who they land on. Half of them were all over me, the other half in Doug’s lap. I WAS MORTIFIED, I wanted to drop dead right there in the aisle. (Like am I still employed?!) Luckily he was cool about it came back and we talked, we joked about it he rest of the flight. When he was getting off the plane he told me he’d never forget me.... guess that’s a good thing right? Most people never even meet their CEO let alone shower them in sparkling water and jack and cokes. OOPS!! "He asked where I was from, what I did before coming to American and how long I've worked here. All small talk. Honestly, the rest is a blur. I was still in shock that it had even happened," Peters said. The flight attendant said that the CEO introduced himself to the staff as he boarded the plane, but that she had gained an entirely new respect for him after seeing the way he handled her accident with humility. Parker even took a photo with Peters. Her encounter with Parker was quickly shared on a popular American Airlines flight attendant Instagram page called AAStews that collects and shares employees' stories. "It's too good of a story not to tell," Peters said.